Game Show Memories – consolation prizes. Backdate. A rather nice electronic organiser. Big Break. A snooker cue and a trophy, and a waistcoat too if you were lucky. Blankety Blank. Probably one of the most famous consolation prizes, the chequebook and pen. It’s really isn’t an exaggeration to say that it was more valuable than most of the actual prizes on offer. Blockbusters. A sweatshirt and a dictionary. Definitely worth having. Bullseye. Tankards, darts, and the bendy Bully. Or the badge and chalk holder that were on offer in the early series. Countdown. What is always called a goodie bag, including cups, books, and the board game too of course. And don’t forget the teapot either. Every Second Counts. Not surprisingly considering this was a show based around time, a wallclock and some watches. The Generation Game. Various prizes in the early-90s revival included a telephone and pocket TV that seemingly only ever showed a picture of Bruce Forsyth’s co-host Rosemarie Ford. Lucky Ladders. A pair of watches. Now they must be expensive. Raise The Roof. This was the show where the star prize was a house, so the consolation was a teapot in the shape of a house, often known as “Bob’s Bungalow” (after host Bob Holness). Small Talk. A trophy that according to host Ronnie Corbett was “crafted by my own fair hand”. Telly Addicts. Another goodie bag similar to Countdown including books about TV, T-shirts and so on. Today’s The Day. A copy of a newspaper from the day that you were born, and maybe a bottle of bubbly too. Turnabout. Another show that gave everyone a dictionary. Not that exciting, but just any excuse to talk about Turnabout really. Wheel Of Fortune. Another show that gave away watches and board games. Wipeout. Early series featured a paperweight, before this was changed to an umbrella. And they all had a lovely day. 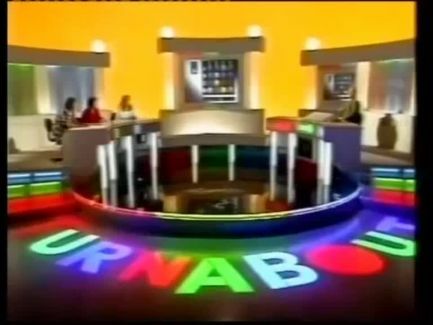 Game Show Memories – Turnabout. Well I can’t resist it any longer, now it’s time to write about one of my favourite game shows. The choice of Turnabout might surprise you as it’s rather obscure now so here’s my memories of that show and why I hold it in such high regard. 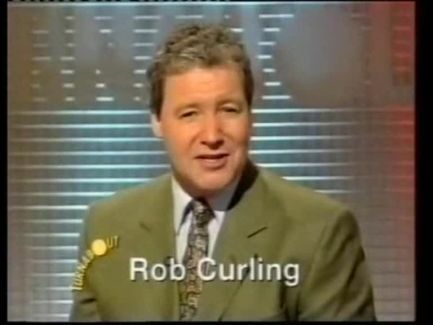 Turnabout was a daytime game show that was shown five days a week and was all about words which was hosted by Rob Curling when he had a day off from Newsroom South East. There were three contestants, one playing red, one green and one blue. They were asked a word clue with some missing letters and they had to guess what the word was. But this wasn’t how they scored points! There was a 4×4 grid with 16 spheres. Get a question right and then you could turn a sphere to try to create a line in your colour. Five points for three in a row and ten points for four in a row horizontally, diagonally or vertically. 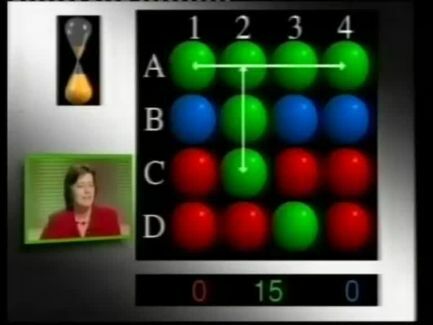 There was a confusing turning sequence of red-green-blue in the early series but then it was changed to the much easier “it just turns to your colour” rule which made for fairer and closer games. But the thing that I liked about this the most though was if you linked enough spheres together you could get combos! All manner of crazy things would start happening and up to 30 points could be scored in one turn. There were a few occasions where a contestant turned all 16 spheres their colour which won them a bonus prize. When the timer ran out it was time for the star game, get 16 word clues right in 50 seconds to score points. The highest scorers returned at the end of the series and the overall winner won a star prize of a holiday. There was a lot that I enjoyed about this show, the questions, the colours, the sound effects. Other extra great things about the show included there being a pool in the middle of the studio for no apparent reason and the funky theme music which I remember someone once likening to sounding like Herbie Hancock. 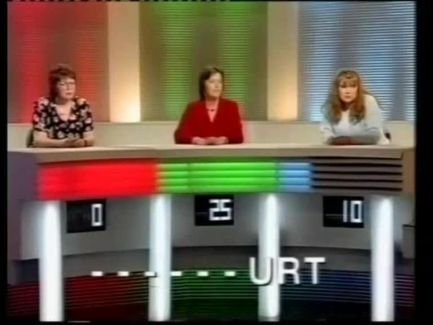 By all means people can like Going For Gold and Bargain Hunt, they are good shows and better remembered, but for me Turnabout is my favourite BBC daytime game show. I never recorded any episodes at the time and the show as far as I know has never been repeated on Challenge, this is the one that I would like to see again the most, particularly the first series which it seems featured a slightly different format, or even a revival. There are a few episodes on YouTube but to see a full series on the TV again would be terrific.